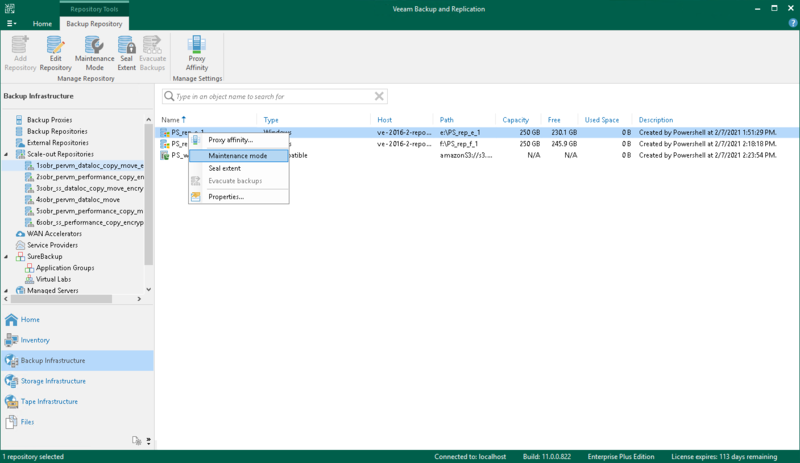 You can put an extent of the scale-out backup repository to the Maintenance mode if you need to perform service actions on the extent, for example, upgrade it or install a patch on it. You must also put the extent to the Maintenance mode before you evacuate backups from this extent. In the working area, select the extent and click Maintenance Mode on the ribbon or right-click the extent and select Maintenance mode. To bring the extent back to the normal operational mode, select the extent and click Maintenance Mode on the ribbon or right-click it and select Maintenance mode once again.